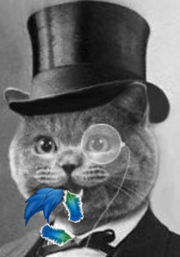 For some odd reasons, it seems that many good IP titles are being released at a time of the year when - at least in the Northern hemisphere - the attention for anything that relates to IP is increasingly and acutely replaced by a slightly stronger interest for holidays, sunshine, and the outdoors. 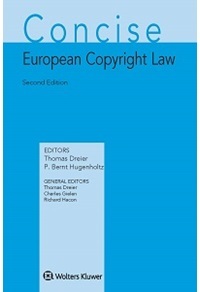 Despite the pretty appearance and title that might induce you into thinking that this is just concise overview of EU copyright law, be reassured that it's not [and not just because the tome exceeds 700 pages]. I first encountered this book (at that time in its first edition) as a student. It was hiding on a library shelf, pressed in between much heavier [in every sense] and thicker copyright books. The fame of the editors prompted me to open and read it: the contributors' ability to analyse relevant EU copyright directives in an essential yet thorough fashion left me very much impressed, and made me realise once again how those who truly master a certain discipline are able to say everything in a way that makes you think that the relevant concepts are actually easy to grasp. The truth is instead that it is not concepts per se which are easy, but it is rather their own explanation which possesses the clarity that can follow a complete understanding. The second edition has retained this distinctive quality, which makes it a pleasure to read and consult. Bonus feature: In my own opinion, the commentary to the InfoSoc Directive (by Stefan Bechtold) is probably one of the most comprehensive and interesting ones currently available. 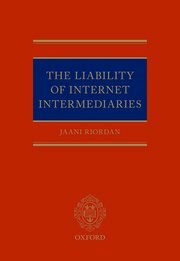 As the author observes in his preface, this is the first book dedicated to the doctrines and remedies which regulate the legal liability of internet intermediaries (or ISPs). Developed out Riordan's doctoral dissertation at Oxford, this book will appeal to academics and practitioners alike. 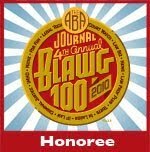 Also thanks to its rational and clear structure, the author has succeeded in a fairly challenging task (that few so far have completed successfully), ie explaining the law of ISP liability by showing also a thorough understanding of the functioning and ongoing development of underlying technologies. Following an inquiry into relevant legal principles, the book also offers specific insights into topical areas of the law, including - amongst others - data protection, copyright, and defamation. A particularly interesting section is the one devoted to Member States' case law in the area of website blocking. This is a must-read chapter that - if nothing else - shows how fragmented the relevant and seemingly harmonised ISP liability framework [and relevant remedies against ISPs] remains within the EU.